According to new research presented by NPD Group, Apple’s record setting last two quarters were not enough to help it fight off Android in the battle for top smartphone OS. Their numbers show that after Q1, Android has grabbed a hold of 61% of the U.S. smartphone market share, with Apple dropping from 41% to 29% in the same time period. I’m not sure anyone would have predicted numbers like these, but then again, this is OS market share we are talking about and not phone sales by one manufacturer, a category that Apple still clearly dominates. 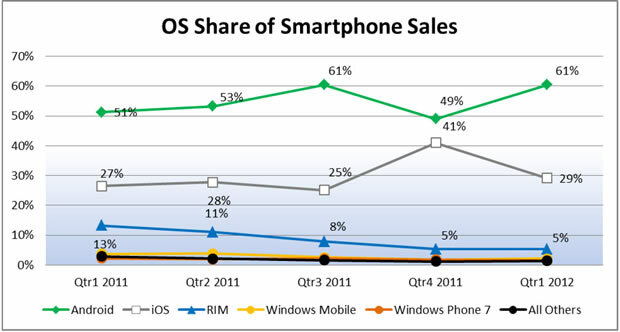 Together, Android and iOS make up for 90% of the U.S. smartphone market. That’s, nuts.